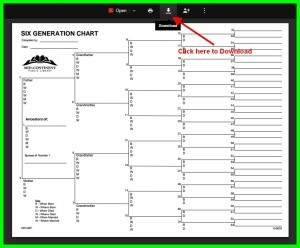 Click on the below link and then click on the Arrow to Download the Six Generation Chart. We will send your free 1 hour assessment of your family tree. After clicking above move your mouse cursor above the pedigree chart and click on the DOWN ARROW to download the form.